Although many of us use our circular saw for woodworking, there’s really no limit to what you can achieve with it if you take care to do it correctly. Many people wonder if there’s a specific metal cutting saw to use when you want to work with this material, and sometimes that will be the case. However, it is possible to use a circular saw for wood and have it efficiently and safely cut through metal. This should only be done if you’re sure that it will cope with the load, the blades have been adjusted to suit metal materials, and the speed of the circular saw won’t be too high, among other safety precautions to be aware of. In addition to these slight differences, there are certain precautions to take and a whole different approach to working with metal rather than wood. A metal cutting circular saw relies on different methods and angles to work, and it comes with a whole set of safety hazards that you might not be aware of. 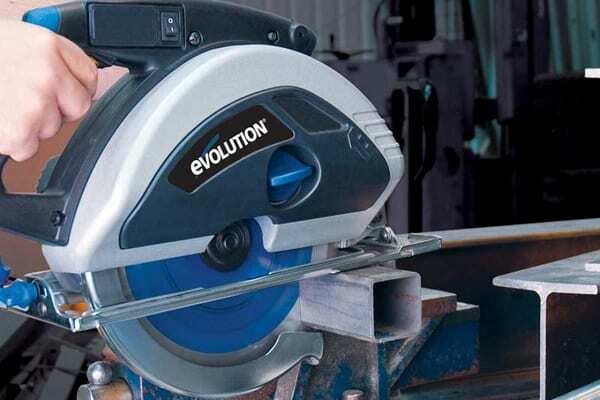 To ensure you perform the cut safely and effectively, we’ve answered some of the top questions asked about cutting metal with a circular saw. What Is The Best Metal Saw Blade To Use? Look for a carbide tipped abrasive cutoff wheel when working with metals like copper, lead, brass, and aluminum, as these are all nonferrous metals. As these are easier to cut through, you’re generally okay to use a cordless circular saw to work with them, but it’s not advisable for other types. If you’re hoping to cut through ferrous metals like iron and steel, you’re going to need something far more powerful than a cordless power tool with a metal saw blade. For safety, it’s best for the home workshop owner to only attempt using their circular saw for the nonferrous metals listed above. You’ll also want to consider the thickness of the material you’re working with, as you’ll need something with a higher tooth count if it’s thin and fewer teeth for thicker metals. Again, each blade packaging should specify what it’s best for, and this includes thickness so that you can match it up with the metal you intend to work with. These are usually measured in inches, so it may help to get specific measurements of the metal you’ll be cutting. When you’re working with metal instead of wood and using a circular saw, there are additional risks you need to be careful of. Compared to sawdust that comes off when working with wood, metal shavings are much more dangerous to work with. For this reason, you need to be sure you’re protected with long-sleeved clothing, goggles, and gloves. However, most metal cutting saws come with a collection port for metal chips, but it’s still best to be protected. Another potential problem with cutting through metal is the heat that can radiate from it, and not just the metal chips which come off. When a saw operates at high speeds, which it can do when using a wood circular saw, the metal can quickly burn. If this touches anyone, it will cause severe burns and will also do permanent damage to your power saw. Because metal can be trickier to cut through than wood, you need to be confident of the stability of yourself and the device. 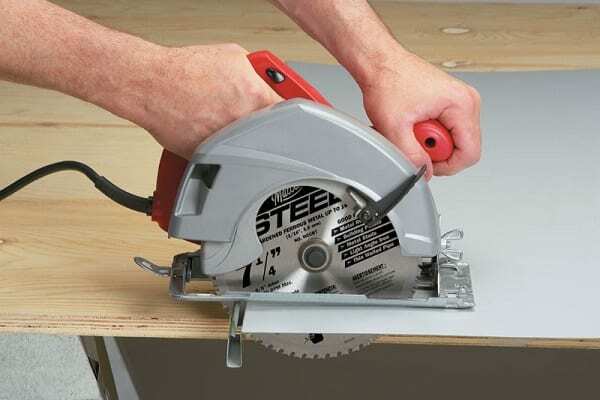 One slip while using a circular saw on metal, and there could be a considerable risk of damaging cuts. You should always keep your arms covered up with never with any loose-fitting material that can easily get jammed in the blade. What Cutting Speed Should You Use? One of the main problems with using a wood cutting saw to cut through metal is the speed, as most of these saws go well beyond the recommended speed for cutting metal. 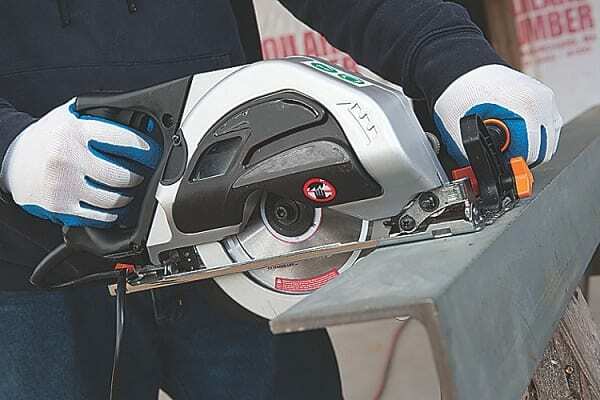 To safely and efficiently cut through metal with a circular saw you’ll need to operate at a maximum no-load RPM of 5,000; otherwise, you may end up overheating the metal and cause serious harm to yourself and your power tools. Although it’s essential to understand about the correct angles, blades, and cutting styles that used when working with metal, by far the best thing you can do is invest in a power saw that’s designed for the job. When you plan on cutting metal with your circular saw you should use one that’s specially made for cutting this material. Otherwise, it is possible to get some that can work with both wood and metal. With so many factors contributing to the effectiveness of the wood saw on metal, like the closed motor housing and speeds possible, it’s best not to take the risk. The main rule that any woodworker or saw operator must go by is safety first and this is one area where it’s probably not safe to ignore. Not only that, but you can burn up your circular saw and find it useless on all kinds of materials, not just metal, so it can be a costly risk to take. There are so many potential risks when working with metal and power tools, so it’s not an area you want to gloss over. With the right circular saw working alongside you, you’ll ensure a faster, more efficient, and safer cut each and every time. When you’re able to cut both metal and wood with a quality saw, there’s no telling what projects you can’t accomplish.